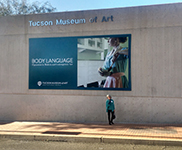 A group exhibition curated by Dr. Julie Sasse, Chief Curator, Tucson Museum of Art. "This exhibition explores themes of nonverbal communication where facial expressions, body postures, and hand gestures are used to convey meaning." A group exhibition curated by Guadalupe Serrano. The U.S. Consulate General Christopher Teal organized exhibition. 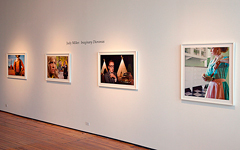 Fifty-two artists representing both sides of the border contributed artworks for the show. A group exhibition curated by David Andres that examines the way artists use the medium of assemblage, collage and fabrication. Jan/Feb 2011 – Review by Scott Andrews in Art Ltd.
"More often, Miller presents well-known actors, and heightens our expectations for drama by arranging the group as if paused in action. Multiple lighting sources, perspective, all the details are arranged with the fastidious care demanded by major film studios." "Truly uncanny, they make us distrust our judgment, such that when we look again at the world outside, it’s a comfort." "The movies never existed and the settings are improbably, but the images are powerful." "More than just proffering famous faces, these photos suggest the entertainment industry's manipulation of perception." "...the artist develops uncanny juxtapositions that defamiliarize and dehumanize celebrity figures." "...wholly original expressions of absurdist glee." 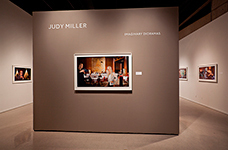 Judy Miller's Outtake #14, Lucy 2 was selected to be exhibited in the Arizona Biennial by Tim Rogers, Chief Curator of New Mexico Museum of Art. Arizona Daily Star, August 2, 2009, article titled, Arizona Art Contrasts, by Rosalie Robles Crowe includes Judy as one of the 12 Arizona artists to keep your eyes on.